On January 19, 1939, Phil Everly was born. Phil and his brother, Don (born February 1, 1937), performed as the Everly Brothers; they were one of the most influential acts of early rock 'n' roll. The brothers began performing at a young age. Their father, Ike Everly, was a singer who had his own radio show in Shenandoah, Iowa. By the mid-1940s, "Little Donnie and Baby Boy Phil" were regularly featured on Ike's show. By the time they moved to Nashville in 1955, searching for a recording contract, they were a polished duo. Guitarist/producer Chet Atkins was a family friend, and he introduced Don and Phil to Wesley Rose, the head of Acuff-Rose music publishers. Rose agreed to help the Everlys get a record deal if they would sign with his company as songwriters. Rose sent the brothers to Cadence Records, which signed them. The first song Cadence gave the Everlys had already been rejected by 30 other acts, but as newcomers, they were in no position to complain. They made the most of the opportunity, taking "Bye Bye Love" into the top five on the pop, country, and R&B charts. "Bye Bye Love" was written by the husband-and-wife team Boudleaux and Felice Bryant, whose songs the Everlys would frequently record during their early years. The Everlys had success with several songs written by one or both of the Bryants in the late 1950s; "Wake Up, Little Susie," "All I Have to Do Is Dream, "Bird Dog," and "Devoted to You" were all Bryant songs. The Everlys were also writing some of their own hits. Don's "Till I Kissed You" and Phil's "When Will I Be Loved" both did well; they collaborated on the 1960 #1 hit "Cathy's Clown." The brothers had a serious dispute with Wesley Rose in 1961. He was already upset that they'd left Cadence Records for Warner Bros. the year before, and he objected when they wanted to record "Temptation," a standard from the 1930s which was not published by Acuff-Rose, and which Rose would, therefore, get no publishing royalties from. Rose punished the Everlys by refusing to let them record anything by Acuff-Rose songwriters, including the Bryants. Because the Everlys' songwriting contract was with Acuff-Rose, Rose even had the power to keep them from recording songs they'd written themselves. Phil and Don both enlisted in the United States Marine Corps Reserve in 1961, which kept them from appearing in public for several months. That absence and their lack of access to the work of their favorite songwriters may have been factors in the end of their most successful period as pop stars. The Everly Brothers had their last top ten hit in 1962 with "That's Old Fashioned." By 1964, the Everlys had settled their dispute with Acuff-Rose. Their new albums continued to be praised by critics, but weren't selling as well and weren't generating much radio airplay. They tried changing labels, but two albums released by RCA in the early 70s didn't do much better, and the brothers announced that their final performance would be on July 14, 1973, at Knott's Berry Farm. The brothers weren't getting along very well by this time. They had always had sharply different political views, and both were struggling with drug addiction. The Knott's concert was a fiasco. Phil smashed his guitar and left the stage midway through the show, leaving Don to finish alone. Each brother released a few solo albums over the next several years. Don had a few small country hits, and Phil made it into the British top ten in 1982 with "She Means Nothing to Me," a duet with Cliff Richard. In 1983, the brothers performed a reunion concert at Royal Albert Hall, and in 1984, they released EB84, their first new album in more than a decade. The lead single, "On the Wings of a Nightingale," was written for them by Paul McCartney, and it was a minor hit, as was the title song from their 1986 album Born Yesterday. Their final studio album, Some Hearts, was released in 1988. In 1986, the Everly Brothers were among the first group of inductees into the Rock & Roll Hall of Fame. Their career was also honored in 1997 with the Grammy Lifetime Achievement Award, and in 2001 with induction into the Country Music Hall of Fame. In 1998, as Andrew Lloyd Webber was preparing his musical Whistle Down the Wind, he released a concept album in which pop musicians sang shows from the musical; "Cold" would be the last new recording from The Everly Brothers. Their final public performances were in 2003-04, when they made guest appearances on Simon & Garfunkel's "Old Friends" tour. Phil Everly made his last public appearance at the Hollywood Walk of Fame ceremony for Buddy Holly in 2011, and he was clearly unwell, struggling for breath. He died on January 3, 2014 of, lung disease. In interviews after Phil's death, Don acknowledged that the brothers had always had a difficult personal relationship, and had become estranged in Phil's final years. Music seemed to be the one thing they could do without disagreeing; "it's almost like we could read each other's minds when we sang," Don said. 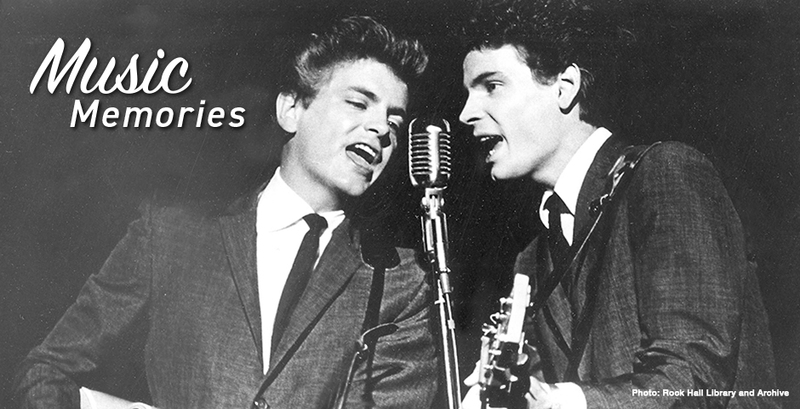 The highlights of the Everly Brothers' career are available in collections covering each era. The Cadence years are represented on The Complete US & UK Singles 1956-1962(volume 1; volume 2); the Warner Bros. decade on Walk Right Back: 1960-1969; and the 1980s Mercury albums on On the Wings of a Nightingale. Most of the Everly Brothers' albums are available for streaming or download at Freegal or Hoopla, along with Don's three solo albums and one of Phil's.